Pricebusters Saving Your Hard Earned Money: Target 5% back??? I have been shopping at Target a bit more lately. Why? They price match, and coupon stack(one of Target coupons, one manufacture's) and you get 5% off with the Target debit card! Now, I know about the complaints of not having stock. I have experienced that myself. Don't forget to ask for a rain check. You can only have 2 of the item but it can't be a weekly wow item. Today, I was in picking up a rain check for the Astro Original Yogurt. It had been on for $1.67. I had a $1 off Target coupon and I got 5% off. So my yogurt cost me .59(I got 2!). As I was checking out I mentioned wanting a rain check for the olive oil that's on 1 L for $3.99. It's considered a weekly wow so I couldn't get one, but they substituted 2 500 ml jars of another olive oil for $1.99 each! 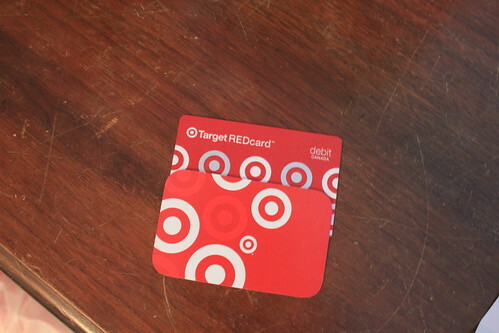 Then the cashier thanked me for having the Red Card and I said I just got it. She said, "Oh, did you keep your past receipts? Bring them in and we will give you 5% on your past purchases!" I hope you have your receipts! I am off to add mine up! PC PLUS POINTS PROGRAM now in the West! Shopping Smart Course This Saturday!